Stories help kids understand who they are and who they can be. Thomas highlights stories that deal with issues like gender, race, ethnicity, religion, sexuality, and socioeconomic class in ways that are real and empathetic, so all students can better understand our diverse world. In 2017, Angie Thomas’s Southern #BlackLivesMatter novel The Hate U Give topped the New York Times Young Adult Best Seller list for 38 weeks — and offered an authentic representation of teens of color that is rarely seen in children’s literature. 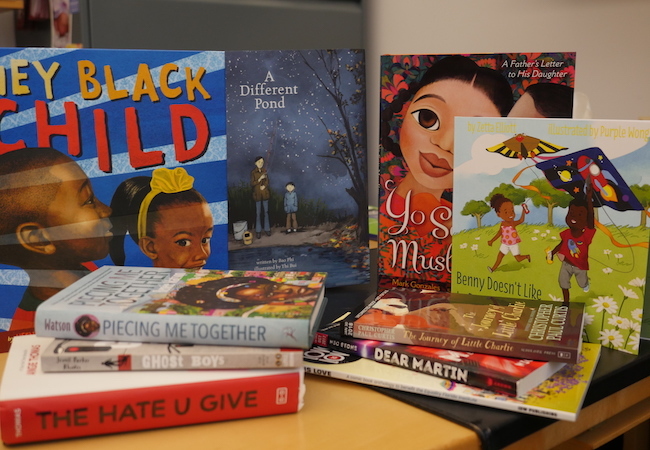 But according to Penn GSE's Ebony Elizabeth Thomas— who studies how race, class, and gender are portrayed in children’s literature, and how those portrayals affect children — too many diverse stories are still being overlooked by critics and educators. Every week, Thomas and her team tweet book recommendations from their  @healingfictions  account. In selecting the top books of 2017 for young readers, Thomas highlights authors and illustrators whose work deals with issues like gender, race, ethnicity, religion, sexuality, and socioeconomic class in ways that are real and empathetic. WATCH: Dr. Thomas and her team talk about some of their favorites this year, and how they selected them. This year’s picture book choices feature a classic in the 40th anniversary edition of Simon J. Ortiz’s essential illustrated history of Native and Indigenous cultures in North America, The People Shall Continue, as well as a new classic in Little Leaders: Bold Women in Black History, by NAACP Image Award–nominated author/illustrator Vashti Harrison. Biographies of Civil Rights activist Audrey Faye Hendricks (The Youngest Marcher), architect Zaha Hadid (The World Is Not a Rectangle: A Portrait of Architect Zaha Hadid), and Supreme Court Justice Ruth Bader Ginsburg (Ruth Bader Ginsburg: The Case of R.B.G. vs. Inequality) will inspire all children. Gentle affirmations for youngsters wrestling with their place in an uncertain world (Yo Soy Muslim; In Your Hands) round out this year’s list. Our middle grade fiction picks this year include lyrical and heartfelt takes on the myriad dimensions of Black boys’ grief — including National Book Award finalist Rita Williams-Garcia’s Clayton Byrd Goes Underground, in which a grandson honors his grandfather’s blues legacy, and debut author David Barclay Moore’s stunning The Stars Beneath Our Feet, whose hero pieces together a new life, Lego® block by block. Diverse collections of poems (Out of Wonder) and short stories (Flying Lessons) are ideal for classroom teaching in the middle grades and book club discussions for young adolescents. Tracey Baptiste’s Rise of the Jumbies is the next chapter in a gripping Caribbean fairy tale, and Hena Khan’s Amina’s Voice provides a window into the life of a Palestinian American girl who is caught between two cultures. Stories about teen love include Adam Silvera’s tearjerker They Both Die at the End and Sandhya Menon’s delightful When Dimple Met Rishi. Cherie Dimaline’s The Marrow Thieves creates a fantastical future where members of the Métis nation hold the key to surviving global warming, while Ibi Zoboi’s American Street provides a look at our current immigration crisis from the perspective of a Haitian teen. And, if young readers liked Marvel’s recent Netflix series Jessica Jones, they will love April Daniels’s Dreadnought. This year’s comics and graphic picks are apropos of the times — America, featuring a glorious queer Latinx superheroine; Black, directly inspired by the #BlackLivesMatter movement’s powerful critique of policing; and Love Is Love, penned in response to the hashtag affirming the rights of all. The graphic adaptation of MacArthur genius Octavia Butler’s debut novel Kindred brings her visions of race and time travel to life through the pens of John Jennings and Damian Duffy. Glimpses into Asian cultures by debut creators Thi Bui (The Best We Could Do) and Julie Kim (Where’s Halmoni?) round out this year’s choices. Penn GSE students Rabani Garg, James Joshua Coleman, Jacqueline R. Dawson, and Doricka Menefee assisted Thomas in reviewing children’s books throughout 2017 and in compiling this list.